Despite Lyft’s best efforts, the company has largely remained in the shadow of its larger, more prominent rival Uber. However, in the IPO race, it seems that Lyft has recently edged its competitor—although both companies have stated their intention to go public in 2019, Lyft has reportedly already hired an IPO advisor, Class V Group LLC, and plans to go public in March or April of 2019. Conversely, Uber is not rumored to have engaged any advisors just yet, although CEO Dara Khosrowshahi has stated that Uber is targeting an IPO in the second half of 2019, which looks like it could be months after Lyft begins trading. Losing out to Lyft in the IPO race may be surprising to a casual user of ride-hailing services, given Uber dwarves Lyft across various financial and operational metrics. Notably, Uber’s 2017 revenue was almost seven times greater than Lyft’s ($7.4B vs. $1.1B), and so far in 2018, Uber’s revenue is nearly six times greater ($5.4B vs. $909M in 1H 2018). This isn’t shocking given Uber’s presence in over 600 cities in 65 countries worldwide compared to Lyft’s relatively modest footprint, which only includes the U.S. and Canada. Uber has also meaningfully diversified its business, offering not only ride-hailing but also services like food delivery and freight shipping, in addition to ambitious autonomous vehicle and air travel business units. Uber’s food delivery service, Uber Eats, is reportedly growing at 200% per year and alone has a run rate of $6 billion in gross bookings. Lyft is tackling many of the same opportunities, although it currently still lacks another revenue growth engine like Uber Eats. However, despite its size disadvantage, Lyft’s financial performance has improved drastically over the last few years as it positions itself to go public. 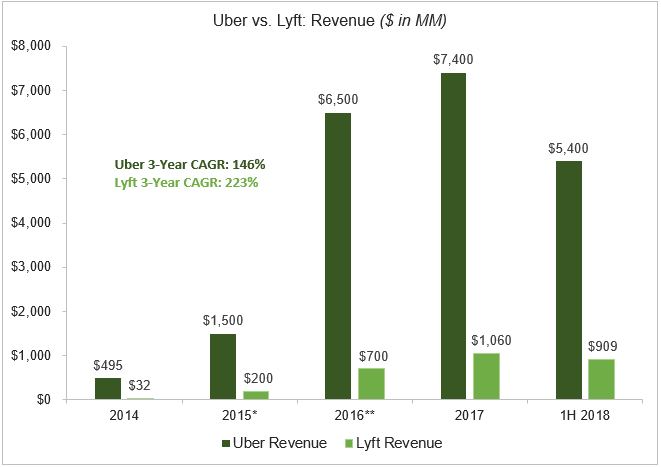 Uber may hold an enormous revenue advantage, but Lyft has actually outpaced Uber in revenue growth since 2014 with a 223% growth rate compared to Uber’s 146%. Moreover, Lyft is charging towards profitability at a faster rate than Uber. 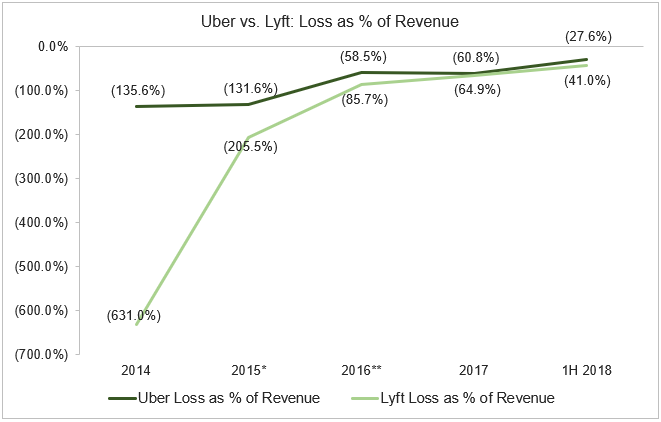 In 2014, Lyft’s net loss as a percentage of revenue was negative 631% compared to negative 136% at Uber; however, in the first half of 2018, Lyft has almost closed that gap with a negative 41% net loss margin compared to Uber’s 28%. But what does Lyft have to gain by going public first? Going public before or after Uber presents a number of potential advantages and disadvantages. On the one hand, beating Uber to an IPO would allow Lyft to be the market leader in setting expectations for ride-hailing companies. This may help draw attention away from its larger rival and lock up investor money before Uber. Lyft would also be able to capitalize on its strong recent momentum—notably, Lyft has captured 35% of the U.S. market as of May 2018 (compared to a market share of low-to-mid teens in 2016). On the flip side, in going public first, Lyft risks the possibility that investors simply hold out for Uber. Moreover, Lyft’s disclosures during its IPO roadshow could offer a competitive advantage to Uber as it makes its own IPO plans. Regardless of which company trades publicly first, we can be certain that Lyft and Uber will be two of the most anticipated IPOs in recent memory and will finally put ride-hailing to the test of the public markets.